My local guild had a stash sale last month and I am still recovering from it, I offered to chair the sale. The guild had another sale two years ago and I was part of that one too, so I knew what to expect…sort of. Now I am sorting, taking pictures and writing descriptions of about 50 + items to list for sale on the internet. Preparing to sell online is a big deal. MUST take a picture of the entire canvas, close-ups also and if stitching has been done, a picture of that too. 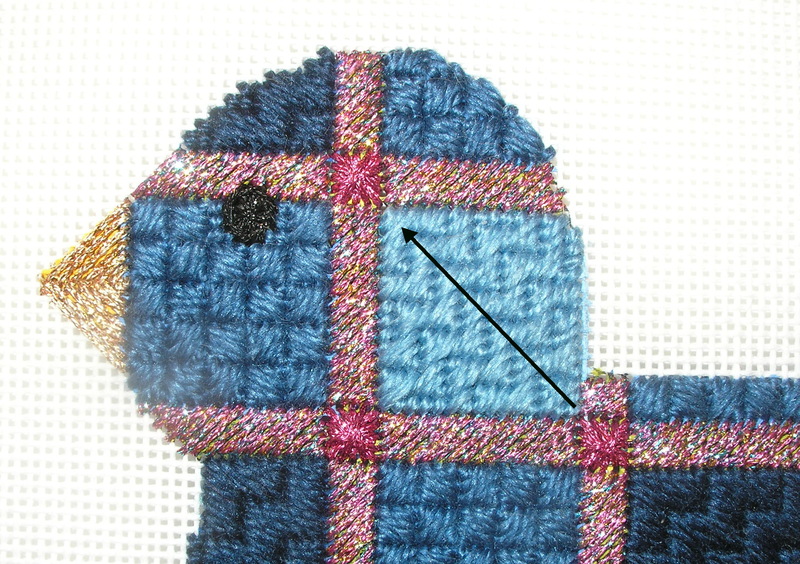 Pictures needed also of a stitch guide, if available and an optional one of the materials list. The materials list is a must if threads are included and then you get to lay all the threads out, check against materials list and make notes of missing or substitutions, and of course a picture of the threads. It takes about 30 minutes per item to get all this done if there are threads involved. I think about one third of the pieces I am doing have stitch guides and threads….Some I already know from the previous owners are not complete and so I am going to list without threads and some lucky recipients will get a surprise when I include the threads I have for their purchased piece (there are about 5 of these). I have also started practicing in the mirror 3 times a day, not to raise my hand above my head and to say the word “No” without following it up with “problem” when I go to guild meetings this fall. It is summer and I run around a lot, so if I miss a week or so I am sorry but I will try to do better than I did last year and not show up for months on end…But we all know how I over extend myself. But I love what I am doing and summer is such a fun time to get out and about. And I have great friends who keep me moving and learning new things , as well as enhancing my stash and “2-it” projects. 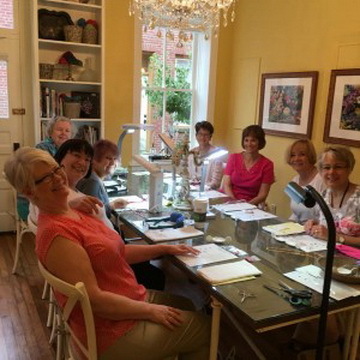 I am stitching at least twice a week with friends and going to beading once a week, not to mention the “2-do” on my desk and the “want 2-do” in my stash. Plus I am still trying to conquer knitting and am crocheting a shawl as my fingers type, not to mention the beading I have in another bag…. I hope everyone has great plans for the holiday week-end; I am drinking iced tea, sitting on my patio (if not to hot or buggy) and stitching something. Gretchen (pictured on left) is the artist and owner and she is another person I would just like to follow around and watch the creativeness dripping off of her. If only I could carry a basket and put some of her creativity into a basket and bring it home. Cathy (pictured on right) is the store manager and is soooooo sweet, just talking to her can lift you up. She claims she’s not that creative but I’ve seen pictures of her house and yard. I think she is creative. And her munchies are very creative….I’ve eaten my fair share. I never go in here that I don’t feel so inspired, it is eye candy for the creative. And I always want more. AND this is one of the places I have been learning new things; I like to think of it as expanding my creativity, that sounds so much better than increasing my stash. But in order to catch up quickly I am just going to list what we (there is always a group of us headed that way) learned in no particular order. We make a day of it; leave KC after rush hour, arrive about 10AM, stop for lunch (great bar-be que place (Tin Cup) in Weston) or Gretchen has a lite lunch if we are having afternoon class. If we don’t have afternoon class we shop and head home before evening rush hour starts. I love my days spent in Florilegium; whether you learn a new needleart or you just go for the eye candy, you are never disappointed. Sure enough Gretchen wanted us all to knit an “I” cord so long…we all looked like deer in head lights…knit? No, we are needlepointers. Gretchen never missed a beat…she told us to pick up our wooden bead, and thread our tapestry needle with our silk ribbon. She explained how to start covering the wooden ball with the ribbon. And while we were all engrossed in doing this, Gretchen slipped out of the teaching area, grabbed a different tassel and was back before our wooden ball was barely covered. I’m not sure anyone else noticed she had left the area, but since I was a needlework teacher, I was watching her to see how she adjusted to our bump in the road. Trust me, it did not faze her and I was in more awe of her. Not only is she soooooo very creative, she is calm as a cucumber. We spent the morning making a tassel. Just before class was over Gretchen slipped out again and came back with a basket of yarn and needles. She placed it in the middle of the table and told us all we were going to have our first knitting lesson. And we did. Everyone tried to cast on several stitches and then she had us all knit. We knitted both directions. She suggested we go home get some size 8-10 knitting needles and a skein of sports yarn and knit the skein. When we were finished with that skein to get another and just purl the skein. And when we were ready to start a project , just come back and she would help us. We all left that day with more than our tassels, but then that’s a given when we go to Florilegium. You can order the tassel on her webpage or just drop by and sit a spell and Gretchen will be happy to start you on your creative adventure with her. We also had picked out our next adventure…beading. ED Note: A group of us get together a couple times and either finished our tassel or made another. And I have a bookmark that we need to do sometime this year. We usually get together again for most of our projects or just to stitch on our favorite things. 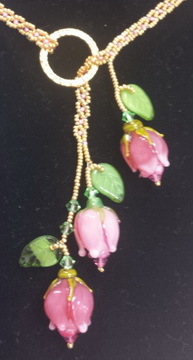 We made a beautiful Rose necklace; the technique is bead-weaving. The highest rose was supposed to hold the gold ring in place around your neck, but mine kept slipping. So I improvised and added another leaf to wrap around the gold ring; this worked sometimes but not always. So I decided to take the top rose off and to reattach above the brass ring. The third time is working; the necklace still goes over my head but the rose above the ring keeps the ring from sliding up. 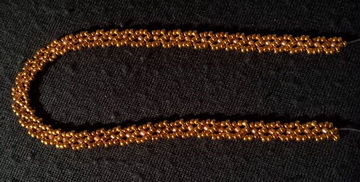 This was my first attempt at beading and so I may someday re-bead because I think with wear the beading thread will stretch…I’m not sure I stretched my beading thread before I used it. 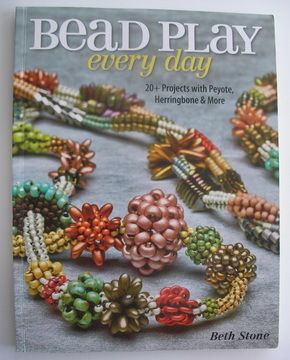 Bead Play by Beth Stone. This was a fun little venture into a new stitch and also different beads. I really got into this and you will see my little piece again down the road. The hardest part was the diamond, but the instructions are in the book and by the time I got to it I had taken a Peyote class and was familiar with that technique too. 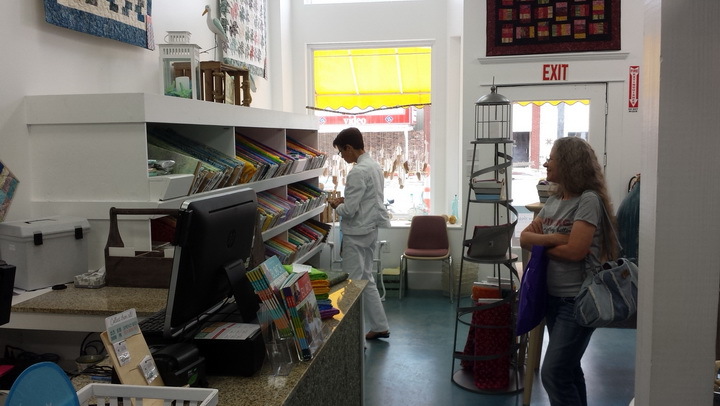 And yet more adventures were awaiting us at Florilegium: two types of needle-felt we learned. Victoria Hart Ingalls (http://www.victoriahartingalls.com/) taught us Proddy Flower needle-felt and later some took Victorian Heart Fine needlefelt (http://florilegium.com/florilegium-events/). Victoria has been doing this a long time I have a bunny I purchased from her when I thought I might want to take up needlefelt. I went to a yearly gathering they have in town, but it was overwhelming to me at the time and I decided needlepoint was best for me at the time. I loved the Proddy Flower and finished mine and used some of the techniques later to make Christmas ornaments. Our next needle-felt endeavor was needle-felting; we made a needle-felted 3D sculptures taught by Kate Barsotti, a really creative person. 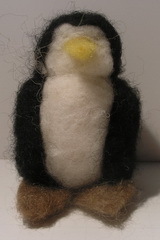 You can Google her and also see some of her things on Pintress or at Florilegium (http://florilegium.com/whats/kate-barsotti-needle-felted-creatures/). My first meeting with Kate was at a Fiber Guild meeting where she presented an introduction to needle-felting and a mini needle-felting class. I though at this class she was so cleaver in the way she presented things. She had a huge box (10 inches long—industrial size) of Band-Aids and told us the needles are sharp and to be careful but if we needed any her Band-Aids were handy. The other thing about her classes is that she does not have a specific 3D project for you to make. She just starts you off making a core of needle-felt and when you ask what you are making; her answer is, “The felt will speak to you.” Mine was a baby Eagle. At Florilegium Kate taught (http://florilegium.com/inspiration/beginning-needle-felting-kate-barsotti-nov-2016/) and we got to spend more time and learned about the different needles and felts and to see some of Kates work. This time my felt spoke up and said “I wanted to be a penguin”. And so a penguin was born. 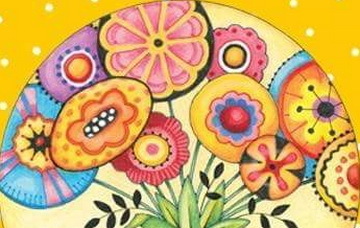 As the weather is getting more spring like I see a trip in my future…a day in Creative land. Next time a trip to the bead shop…but for now I have not given up needlepoint, so I am off to stitch although I should practice knitting too…no I am going to needlepoint today. After the stitching is completed then the piece has to be finished. I know I have been showing how to finish needlepoint but last year I was not up to the task of finishing. That’s my story and I’m sticking to it…Seriously, I can do ornaments and some other little stuff but really haven’t had the time to try the biggies. One day I am going to try a pillow and a purse but for now I’m going to send big pieces to the finisher. I can’t even find time to sew a button on, let alone make a blouse or finish big needlepoint or for that matter any needlepoint. 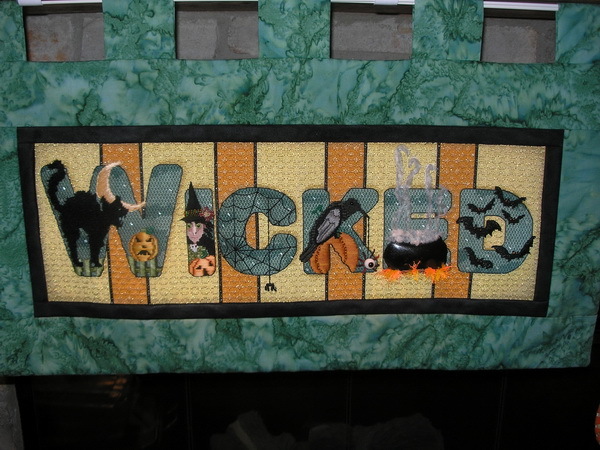 I knew where I wanted to hang “Wicked” and how I wanted it finished. I drew a picture for the finisher and once the material was purchased I sent it to her to do her magic. I was very pleased with the way it was finished and I love to see it hanging at Halloween. To some people finishing a piece of needlepoint is easy; they take it to a trusted shop and have it finished. Not me, I agonize over finishing. As I am stitching I can see the finished piece, I get these pre-conceived images in my head and then I feel like I need to look for the material to finish the project. Nice for me I know the finisher and I can as her if my idea will work. If she says yes, then I’m off to look for material. Now, let me give you the advice I seldom ever follow but every finisher I know will tell you is the truth. You should buy the fabric for finishing before you ever start stitching. I know, seems illogical to me too, but remember we are limited by out thread choices and the fabrics we choose to finish our pieces are limited by their color choices. 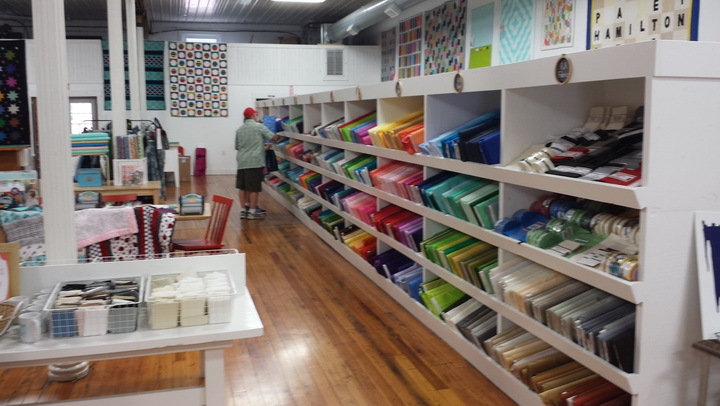 Now I will admit if you go to Hamilton Mo or any large quilt shop, you should be able to find a fabric. But what if you want a velvet or moiré for that Christmas stocking you are spending hours stitching? There is a world of difference between DMC 666 red and DMC 321 or 498 red. And fabrics only come in certain colors. 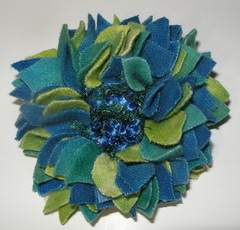 And yes, you could use green for the backing and lining, but there are different greens too. So, if you want as perfect a match as you can get; sometimes it is important to buy that fabric first. 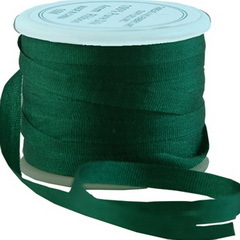 And while we are talking “you buy the fabric”; remember that if you want self-cording you need extra fabric. Self-cording is cut on the bias of the fabric and will require more fabric. 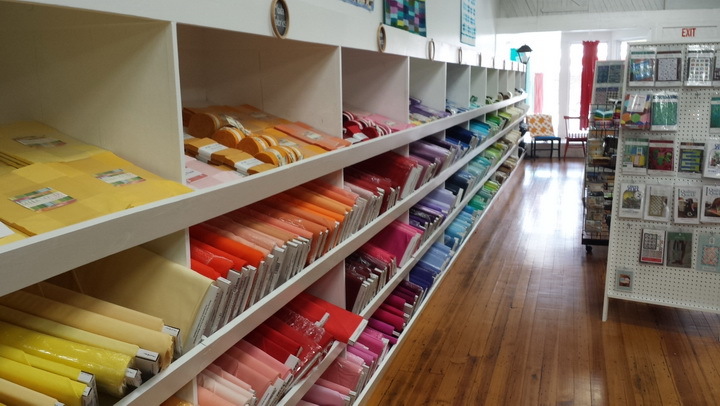 Just as local needlepoint shop or finisher how much fabric you will need to finish your piece. And some shops stock fabrics for finishing, so ask before you head all over the countryside looking for that perfect fabric. Some finishers have fabrics stockpiled and if you ask the shop you use, they probably can tell you which red would be best on that stocking or they can ask the finisher for you. 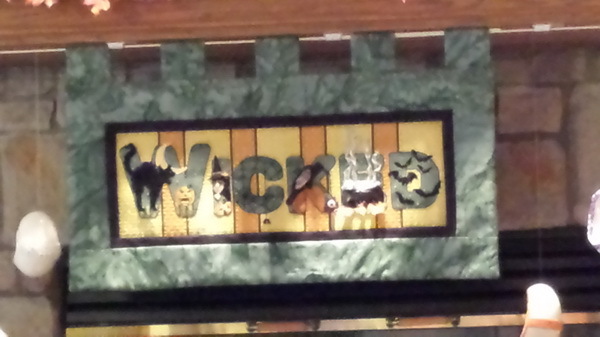 Back to “Wicked”… I found the fabric and Batik at Hamilton and bought it. Brought it home and took it to the shop for my finisher to pick up (No, just because I know her doesn’t mean I don’t have to take it to the shop. My finisher will not accept pieces except through the shops she does finishing.) I took the piece about mid-May and I got it back about mid-August. What took so long? Mine was not the only finishing in line. Mine had to be blocked, just like the rest and maybe twice I didn’t ask; and it’s a pretty big piece so it took up some real-estate on the blocking board. Mine also only had the green material supplied, so my finisher had to get the black for the inset, thread and even the interfacing. I could have purchased the black but I didn’t think about it at the time and she suggested this after she saw the piece…that’s another reason you use a finisher…She’s seen enough pieces to know what looks best even when you limit her by you pre-conceived finishing. And I had no idea what interfacing she would recommend. So see, Finishers do more than finish; they make your needlepoint look just like you want, and they know from experience what works best. When “Wicked” returned home, it was just what I envisioned and more. I hung it and hated to see Halloween come to an end. I sometimes think I stitch long hours for a piece that only is displayed for a short time but I like it and it brings a smile to my face. And I hope it will be around for many years to come, maybe even one of my Grandchildren will want it when I am gone. Sometimes I get it out in it’s protective bag, and hand it on the door of my office just to look at it…it makes me smile. Oh and before I forget; what do I do with the stitch guide after I complete stitching the canvas? I destroy it; it is a copyrighted piece of work. And in my opinion, stitch guides should not be bought or sold without the purchase of the canvas! I have done two or three stitch guides for canvases and I will not sell them to individuals only to shops where I assume the canvas is purchased. I know a stitcher who saves her stitch guides as a reference and that’s fine but I don’t want all the extra paper. I might make a note in my computer or my stitch notebooks I keep about a technique, stitch pattern or stitch but my stitch guide goes to the trash. I do not share it with my stitch friend who bought the canvas only because she liked mine. I destroy it. Enough said…my soap box stand for the week. On another note…my family is having a garage sale…no needlepoint but I do have needlepoint books I have accumulated over the years. I will list them here next week with cost and then I will put them on Needlepoint Nation Stash after that. Thank you for stopping by, I hope you have time to stitch today and over the holiday week-end. AND please don’t forget to honor those you know who are serving or have served in our military. Without these brave men and women we would not enjoy the freedoms we take for granted. 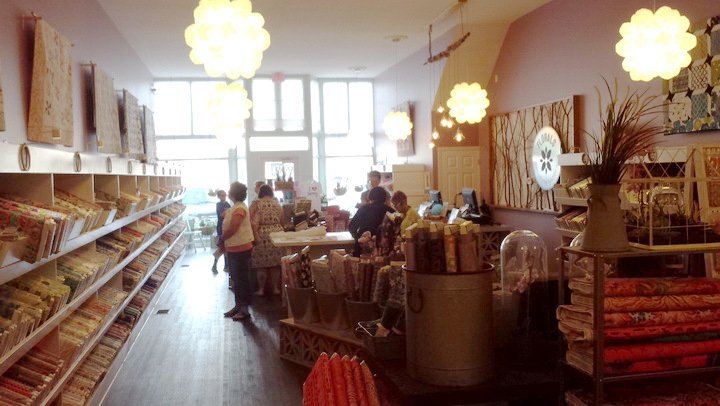 My friends and I love a shop in Weston, MO; Florilegium (http://florilegium.com/). The owner Gretchen is wonderful and so creative. You just want to spend time with her hoping that the excess creativity will fall off onto you. And Cathy the shop manager is the sweetest person on earth; she always has a smile on her face and never seems to get rattled when we all descend on her at once. It is the most fun, creative, relaxing place on earth! Go explore the website and you will get a feel for the place. But like I’ve said before…If you fly into Kansas City airport, make sure you have a three hour layover and make the trip to Weston (maybe 30 minutes north of the airport)…maybe you should just spend the night at a Bed & Breakfast in Weston…there is so much to do there but Florilegium will captivate your heart if you are a needlework person or just a creative soul. Also make sure you are here the later part of the week…I don’t think they are open on Monday-Tuesday and maybe Wednesday…but you can call and if someone is going to be at the shop, they will let you in. But back to the catch up…My friend Nancy and I drove up one day for something to do and Gretchen taught us her method of Kumihimo braid. It is really an old technique, and of course many cultures have a braiding techniques also . Kumihimo braiding can be as simple or as complicated as you choose to make it. Like any technique the more you practice the technique, the more proficient you become. I have seen people who do these braids and never look at the pattern. They are really good and get the count down perfectly; they can start and stop anywhere while making their pattern and never mess up. There is a rhythmic method to the patterns you make and can be very relaxing once you get that rhythm in your head. I have to really concentrate if I am doing a pattern design; I have to stop at the end of a round so when I pick it up again I don’t mess up the pattern. I think that is why I like the Gretchen methods of Kumihimo best, but I will always be a novice. Nancy collected supplies for us, we had round and square Kumihmo boards; you use the round disk for round braids and the square disk makes flat braids, they also come in different sizes for small and large braids. We collected yarns of all types and have a bag of these too. and Braids by Roderick Owens. I like them all but the last two are my favorites because they have color pictures of the braids. Nancy even indulged me with and authentic Kumihimo stand. It is beautiful and I use it when I am not braiding to hold my current project or it just sits in my studio to remind me of the fun times friends have together and are always pushing our creativity to learn new techniques. 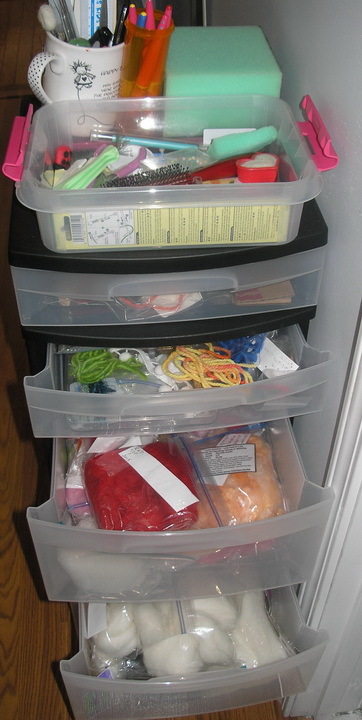 And even though I am a novice and will probably never be a more than dabbler in this technique, I knew I was hooked when I had a lunch box and bag for my supplies. In my lunch box I keep a pair of working scissors, a tape measure, weights, the different disks I have and my current project. In my bag are different sized bobbins, some sample braids I have made to see patterns and the yarn for these sample braids. I enjoy making the braids for projects, but I will tell you this method takes more yarn and time than making a twisted cord. The advantage to this is you can make a pattern braid or just a braid using many of the threads used in a project. 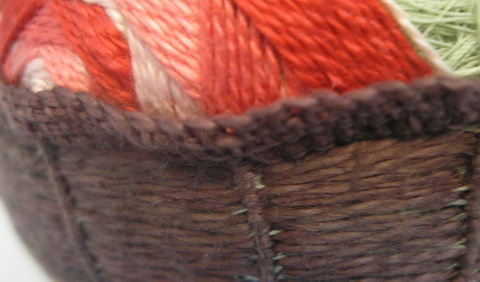 Remember when you are planning this that you will need threads that are available in skeins; cut threads will not work. 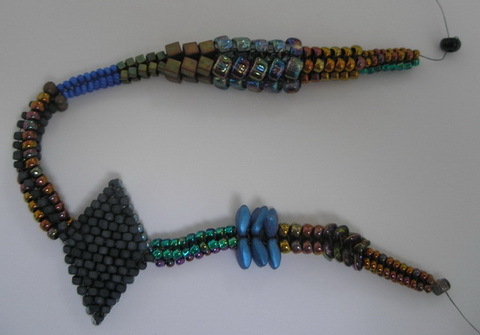 And if it is a large project you may have to make a couple braids to complete project. I made a braid for a Christmas present and it turned out to be too large for the project. So saved it, and I am planning on using it for cording on a pillow I just finished stitching. This is the one I finally made for gift I made last year. It is just #5 perle cotton. This is my pink flat braid I started with Gretchen at Florilegium. I am not sure what I will do with this when complete but it would be cool appliqued to a jacket or used in a crazy quilt design some way. 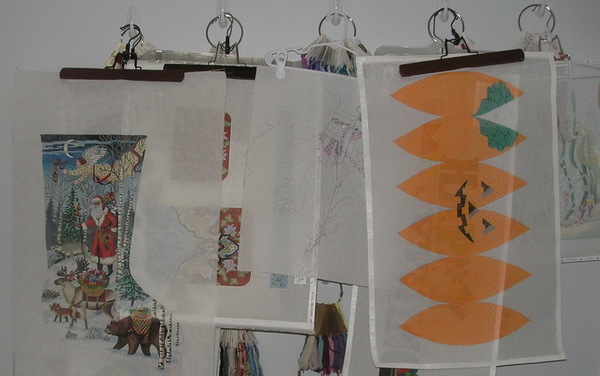 These are samples I have made of design patterns using suggested colors so I could follow the pattern. I have my bag and supplies and when inspiration strikes I will be ready to begin. I think it would be interesting to make several Kumihimo braids and then braid these braids together to make an thicker Kumihimo braid to use and a garland or intertwine in a wreath…I can even see making a Kumihimo braid to use at a lanyard for a cool bead or even a beading project. I even see making a braid to couch in needlepoint…oh so many ideas so little time. Needlepoint will always be my first and main love but I think in order to expand or creativity we need to explore other techniques. It doesn’t mean we will ever be as adapt as the person who loves their chosen technique; but at least we will be able to recognize it when we see it and we will have at least a passing knowledge of how it is done. And sometimes in just knowing the method, inspiration will strike and we will be able to adapt one technique to our chosen method of stitching and make something really creative. Thank you for stopping by, I hope you have time to stitch today or do whatever your chosen technique is! While I was not blogging and trying to get my stitch mojo back I made a couple Temari Balls. The first one is a pattern I love to make, it is very simple and the beauty comes from the negative space that is created by using one thread the same color as the base of the ball to stitch the design. This one was stitched for my knee surgeon; he graduated from KU so it is the KU ball. And since I am partial to blue the ball is predominately blue. He loved the ball and I love him (he did a great job on my knee), so we are both happy. 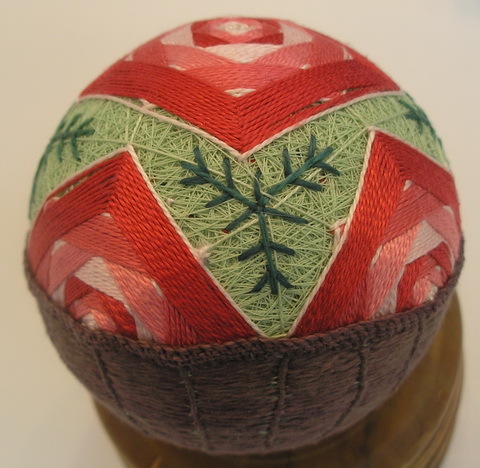 The other Temari ball is an original. I have a new Great Grand-daughter (I am a two time great, so far…boy and girl) and her middle name is Rose. Rose was my mother’s middle name (we called her Whammer…for grandma, but that’s another story.) It was also my favorite Great Aunt’s name and I think it is a name from Catherine’s family also.) So I decided to make Rose’s mother a basket of roses. First I stitched the top rose and then the partial side roses. Then I started on the basket. First I wove the basket from the SP to the Equator in a ribbed spider web stitch. Then around the top edge I made a detached buttonhole border for the lip of the basket. Turned out cute. 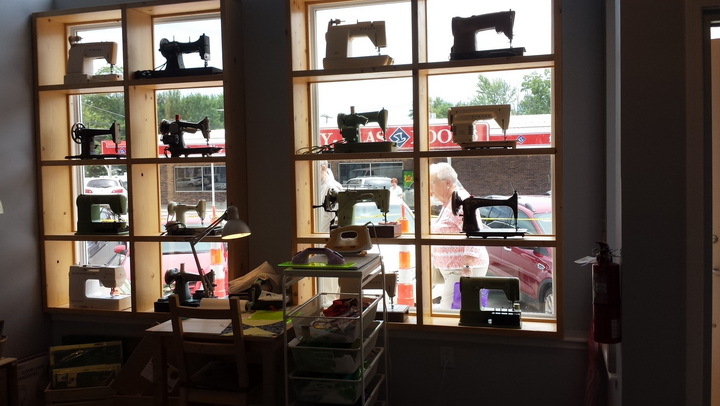 “More about Hamilton too…I hear it is a quilter’s mecca.” This is what I said last week about Missouri Star Quilt Co in Hamilton, Mo. Well, after being there, there is no way to really describe it to anyone; it is an experience that will be different to everyone who visits. Words like eye-candy, beautiful, overwhelming come to mind; but it was so much more too that I will have to re-visit several times before I feel like I have an understanding of everything this quilter’s/ fabric mecca has to offer. It is the town! 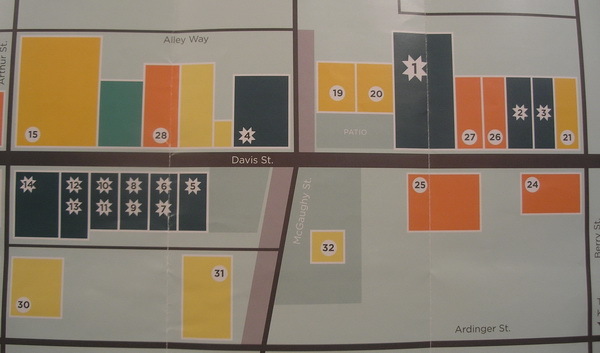 You have to go read the history of Missouri Star Quilt Co and Hamilton, Mo: https://www.missouriquiltco.com/. And if you are anywhere near Kansas City, Mo (and I mean even if you have to travel 2-3 hours out of your way and it is one of the only things you do in Kansas City) add a day to your trip for a stop here. Even if you are not a quilter (and I am not) it is something any creative person should see. 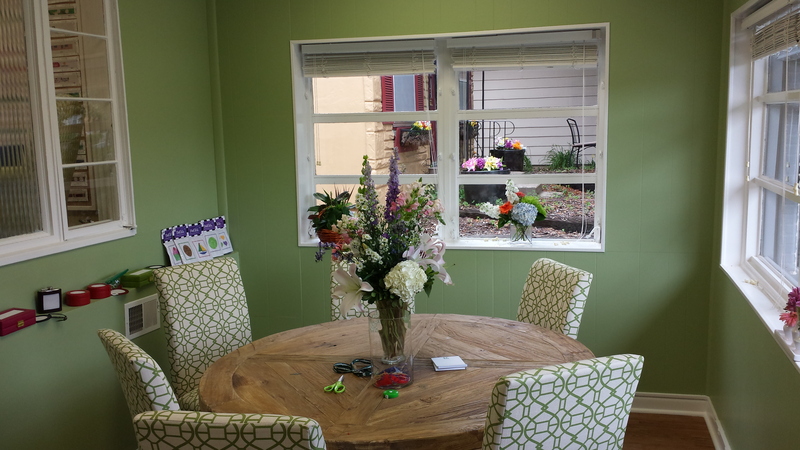 If you own a textile shop, you need to just study their presentations and marketing…excellent! Oh my gosh, I would still be standing in the first shop taking it all in , if my friends had not kept me moving and by the end of the day I was in the Man Cave waiting for them. My mind was in overload, my visual senses had shut down and I am still recovering from a wonderful day in Hamilton, Mo. complete your project; it’s all there on your account. Every store can scan your card and bring up your purchases and see the fabrics, trims and patterns you have purchased. Here’s a picture of my account. This is so cool and so helpful. We strolled down the street to the reproduction fabrics and then the floral shop ( a garden of fabrics and no weeds). Notice the lights look like flowers and the front of the store window gave you a clue to what was inside. 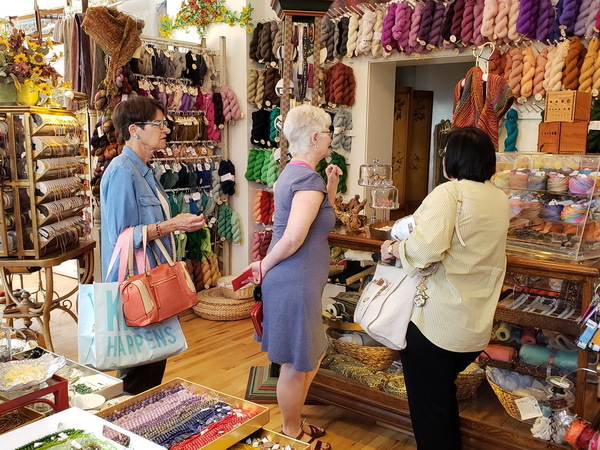 We went into Primitives and Wool, wool fabrics and yarns and Primitive fabrics…not up my alley but impressive from a marketing point of view. Next was the Batik Boutique and here I lost all sense of reality, found three of the five fabrics I was looking for here…Oh my, what a colorful place! Next we headed upstairs for four more shops…Seasonal Shop, every occasion you would like to celebrate in one room; Modern fabrics had newest fabrics and designer fabrics; Backings & trims was a room of finishing fabrics (extra wide) for backing your quilt and all the trims you could want; and finally kids and baby area with all the fabrics any mother and grandmother could want to furnish a nursery. I was in fabric overload now and headed down to the “Machine Shed” for all the gadgets you can imagine and isn’t their window too cute…and right next to the Machin e Shed was the Man’s Land. 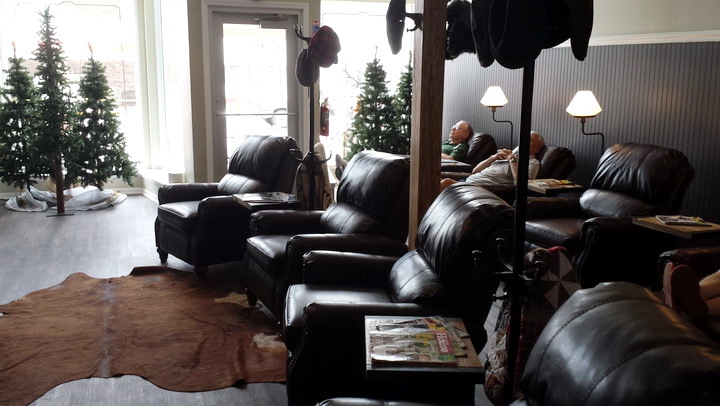 A room to relax, designed to keep the husbands happy but I checked out the leather chairs and they were comfy. I missed the girls, they came down another way and so I had to visit the last shop on my own. JC Penny quilt shop is the colorful solid store. 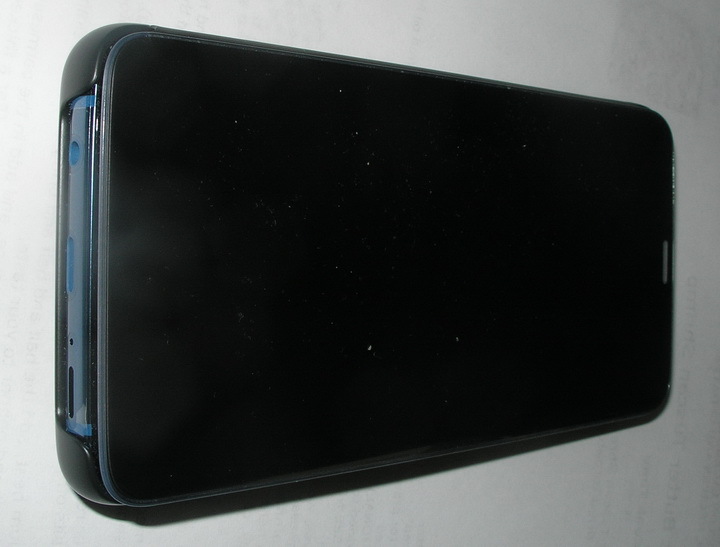 If you can’t find a solid color here it is not made. 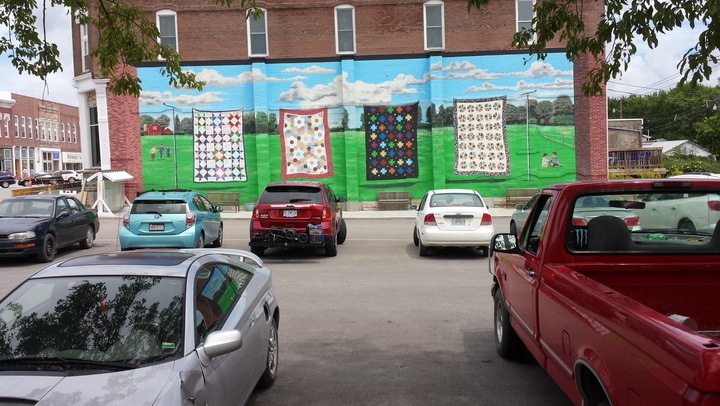 Four hours later, we had briefly touched the surface of Hamilton, Missouri and the Missouri Star Quilt Company. 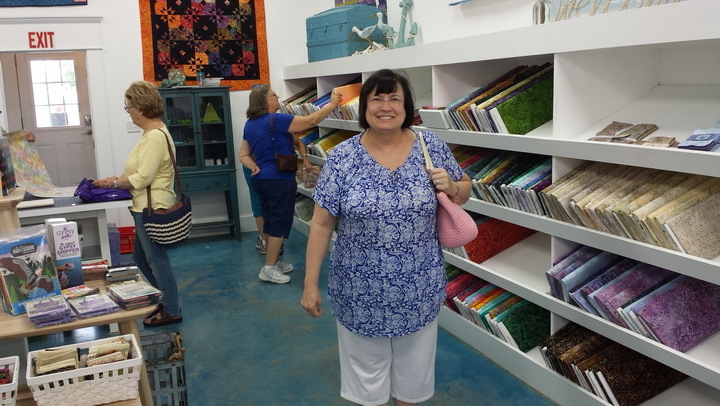 It was absolutely mind boggling; the fabrics, the colors and all the quilts hanging in every store, not to mention the projects stitched with the fabrics. At times I felt like a kid in a toy store..I want, I want, I want. 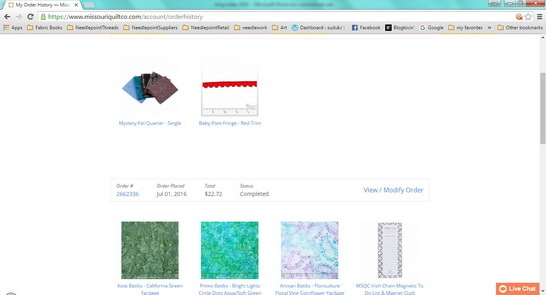 And I did buy a few things…material for finishing 3 pieces of needlepoint…sending to the finisher. I purchased two patterns; one to use for a stitching idea and the other a finishing idea. And I bought a 1/2 yard of material for several other stitching ideas. Will, I go back, in a heartbeat! Just let me know when you are in town and I’ll drive you up there. 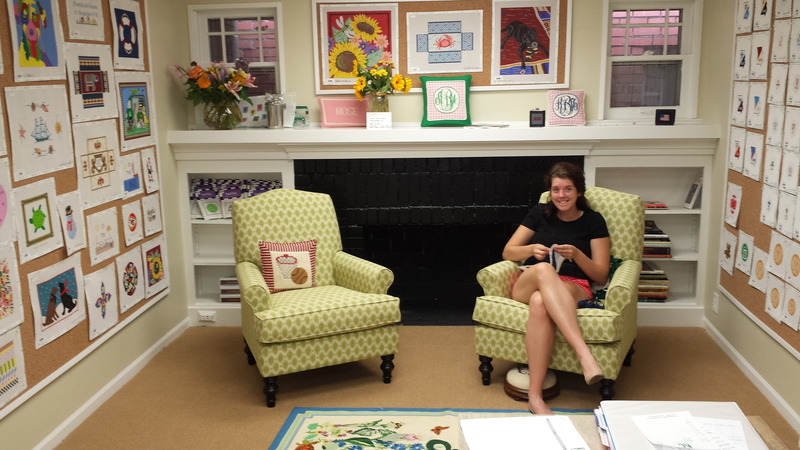 I can take my needlepoint…the ones that still need finishing and a project I am working on. I promise not to hurry you; I can always go to the man cave and stitch while you soak up all the creativity this place offers. 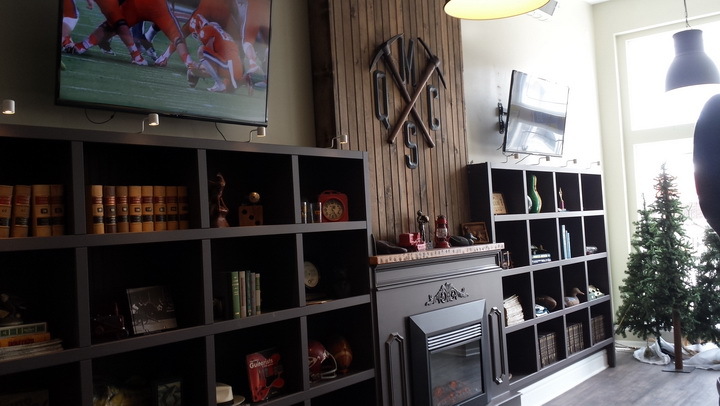 In fact you better plan on spending a couple of creative days maybe more here in KC , might even want to try our bar-be-que, take in a baseball or football game (depends on when you are here. 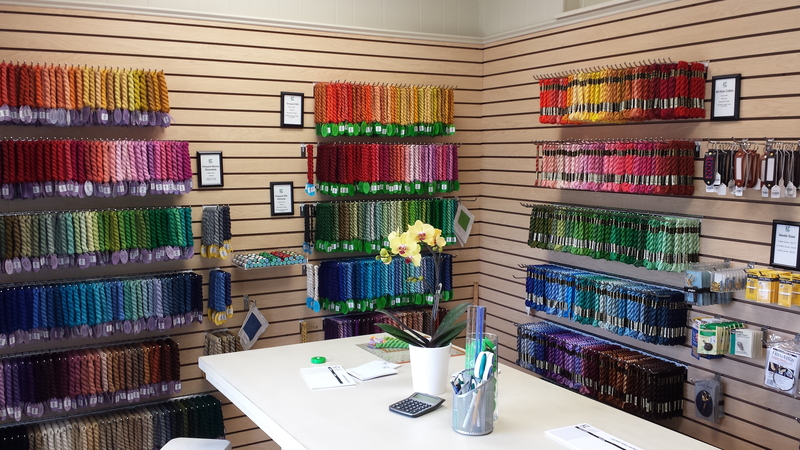 We have another shop in Weston, Mo that is also creative eye candy for anyone creative or who wants to be creative…more about that later. And don’t ask me to pick one, because if I were younger I would be moving north to be closer to these places…I’m about 1 1/2 hours from either but it is worth the drive. Thank you for stopping by, I hope you have time to stitch today! 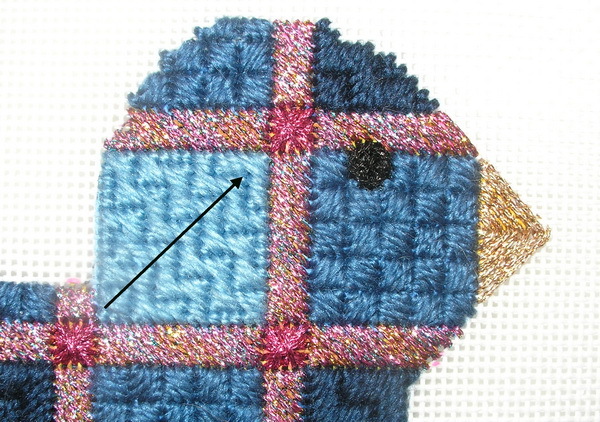 I made another creative decision on the bird bodies I made sure the stitches were slanted the same on both sides. I guess I should say I reversed the direction of stitches for one side. Whatever, I did it and it was a conscious decision. I think bird wings and sides are going to be the most fun, but probably the most labor intensive. I have been watching the internet and the trend to use silk ribbon in stitching and just being so creative stitching flowers. I collected a few pictures from the internet that I thought would inspire me and set them aside for reference. 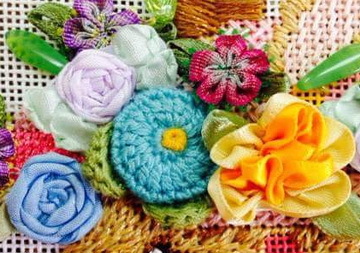 You can just google “silk ribbon flowers for needlepoint” and click on images for an unlimited supply of ideas. And since this piece had lots of cute flowers… I decided to play. I also had purchased Bullion needles from local shop earlier this year. (https://sudukc.wordpress.com/2015/02/08/hari-kuyo-broken-needle-celebration/) and wanted to play with them too. 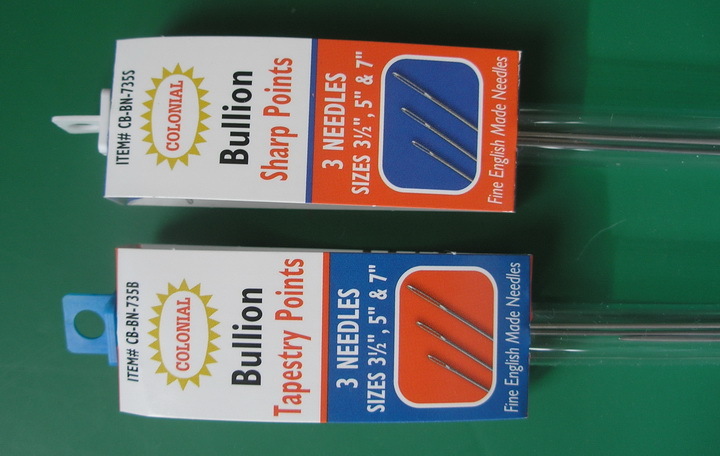 These are from Colonial needle and come in two types (of course I have them both): Tapestry or Sharp Point Bullion needles. There are three needles packaged in a plastic tube for storage; there are a 3 1/2 inch, 5 inch and 7 inch needle in each package and they are equivalent to a #20 Tapestry needle in size. While I would like to see smaller sized needles available, we will play with these. And of course there were more thread changes to be made. I have spent the last few days gathering up threads, silk ribbons and beads I think may work. 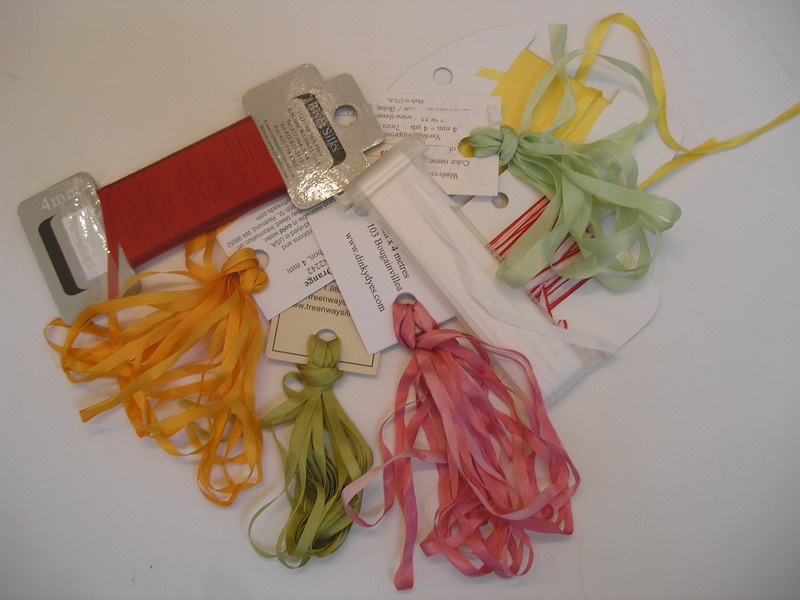 I have a stash of silk ribbons for that future day of fun…so today has become that future days /weeks of fun. I am sure there are others, but these are in my stash; I’ve seen one on a spool and would love to find it someplace…I just think the little spools are too cute. Anyone know where these can be purchased? And I would be remiss if I did not tell you about Florilegium…If you are in the Midwest or plan on being here; plan a trip to Weston, Mo (http://westonmo.com/?page=home). 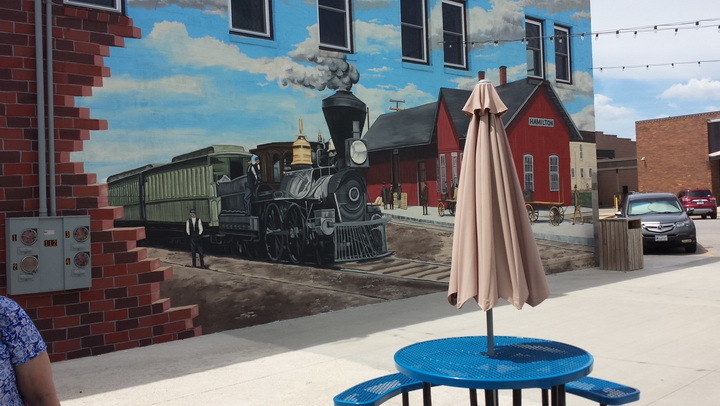 It is a quaint little town about 35 miles (45 minutes) north of Kansas City or 30 minutes from KCI airport. Great shops and food. Make sure it is a week-end, that’s when most all shops are open. But DO NOT MISS seeing Florilegium (http://florilegium.com/), even if you have to call ahead and make an appointment for early in the week visit; this is eye candy overload for the creative soul. 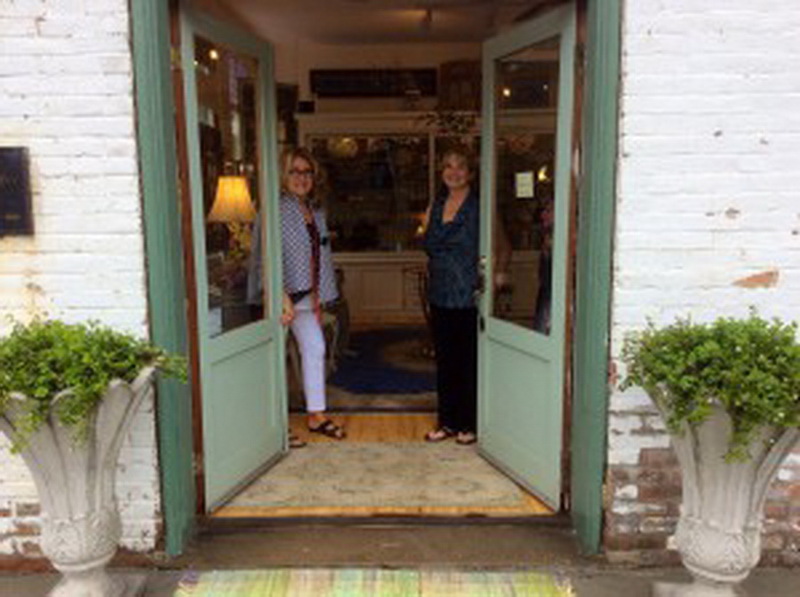 Gretchen is the owner and Kathy, her friend, are the two sweetest ladies around. But the reason I mention them here is that if you need a silk ribbon Gretchen dyes them and has beads, embellishments and ribbons forever. It really is eye candy overload! Every time I go in there I feel like a kid in a candy store and when I leave I am exhausted and know I missed half of what was right in front of me. But I digress…I have a few books that I need to look through too. I’ll post again in a day or two with a list of books I have. Even though I prefer a book in front of me, the internet is always a good source and sometimes you can find videos that allow you to see the stitch being created. But first I am going to Basketweave the backgrounds of these pieces. Yes I am going to use Silk and Ivory in medium color blue. Remember I use #20 or #22 tapestry needle…it works. I will Basketweave right up to the flower edges and if I have to go back and fill in I’m sure it will not be noticeable for all the flowers. Thank you for stopping by… I hope you find time to stitch today! I am stitching, just have nothing to share yet…but I will. Today I went visiting. 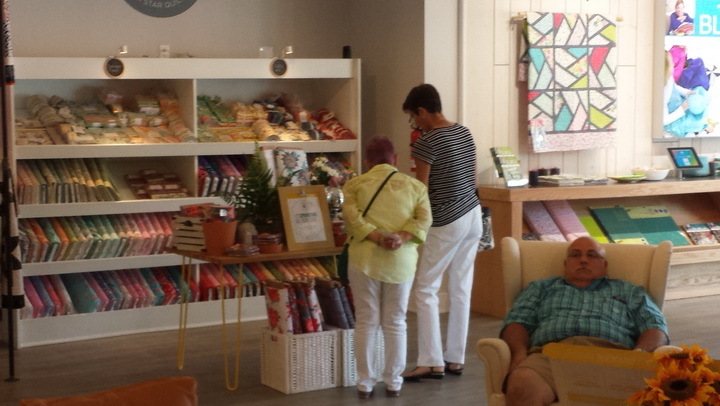 We have a new needlepoint shop in town. I remember when we had five or six shops, maybe more, but sadly were down to two shops, but now we have three. 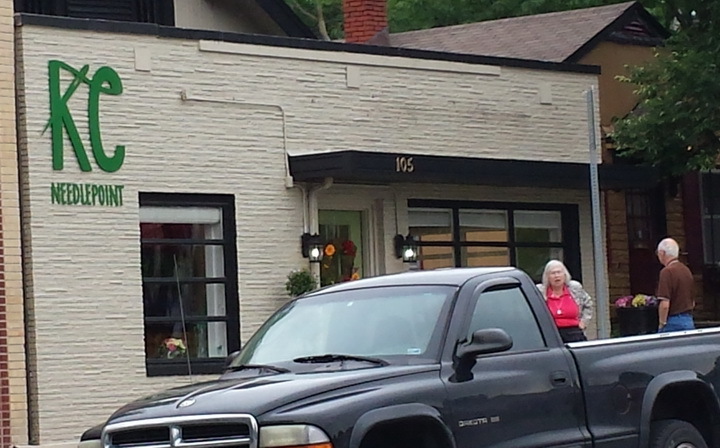 This new shop KC Needlepoint; 105 East Gregory; Kansas City, Mo. 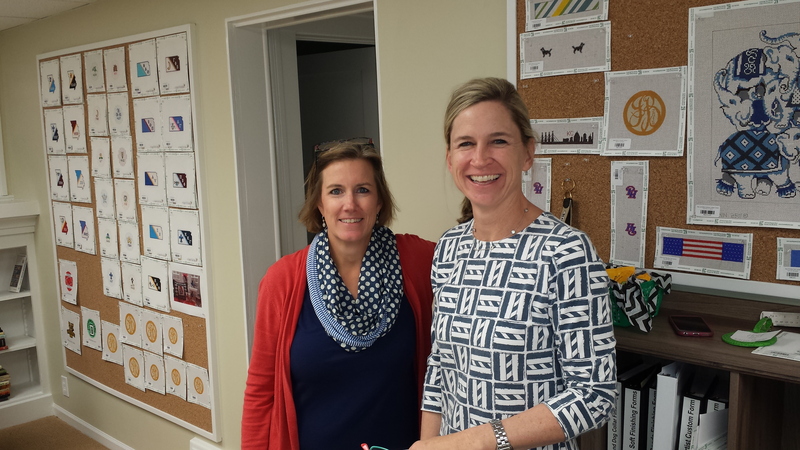 ; http://www.kcneedlepoint.com is owned by two young excited young women…Polly and Carol. They are starting out small with the basics and will slowly add to their inventory. In this day and age I think this is a smart idea…it would be nice to think that someone could open a shop with every thread and lots of canvases from many different designers, but the reality of today’s market is that is not economically feasible nor would it be a smart business move. 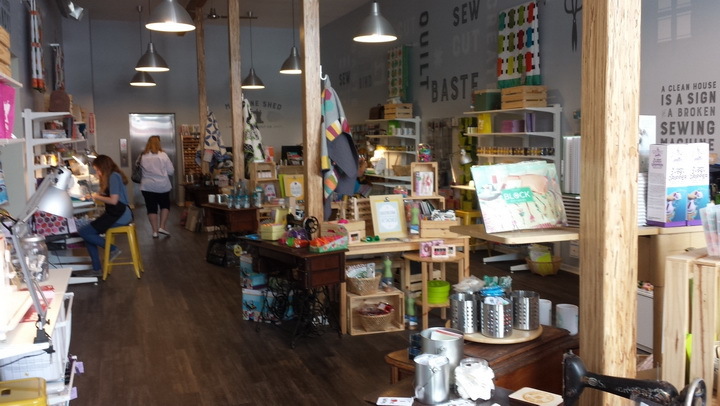 Their shop is bright and refreshing with great areas for stitching and lots of areas to expand. Wherever we live, we need to support these young people in their ventures. They are the future of our art. 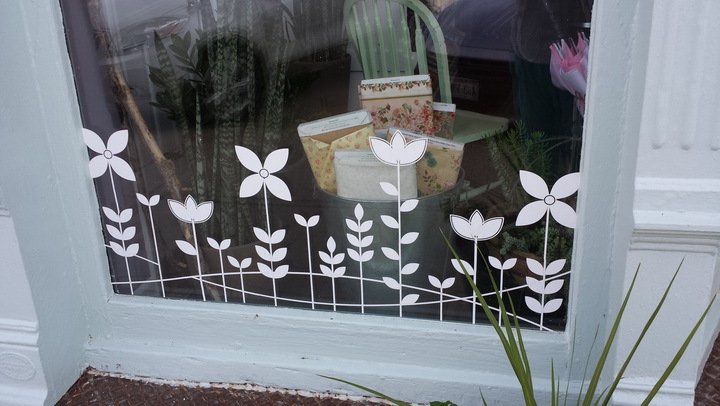 If we are to survive as a needlework art, we need to support these new fledgling shops and help them to survive. Because without them we all lose! We not only lose that place to go and meet others who like us have a love of handmade needlework. We lose the place to learn new stitches, new techniques, new ideas and exchange ideas. We lose a place to SEE and buy our canvases and threads. But most of all we lose the place to connect one generation of stitchers to the next, we lose those young people we so desperately need to keep this art alive. Remember the old Girl Scout song…”Make new friends and keep the old…one is silver and the other gold.” We all need each other, we need to learn and teach each other. So I urge you to support your local shop or shops no matter how long it has been in business. And especially support that new shop, she (they) may be the new designer or teacher of the future.